CRAZY DISCOUNT! Was: $1,299.95 Now: $599.97! 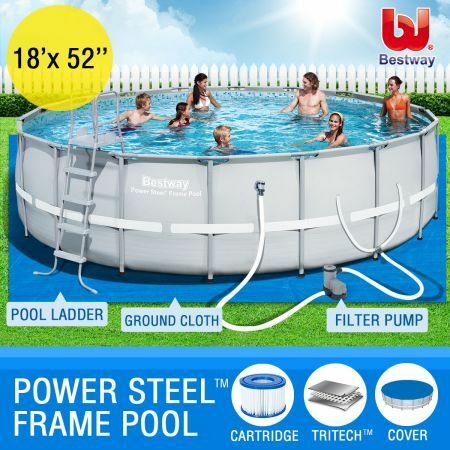 Dive into summer with the 18ft Bestway Power Steel Round Frame Pool! This home swimming pool is Ideal for little ones to stay fit and healthy by swimming lengths and playing games, but equally as good if you just want to get the inflatable lounger out and get stuck into a new book and relax. 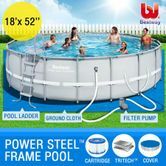 Built to withstand large water volume weight, harsh ultraviolet rays and chlorine, this is a pool that's going to stand the test of time, giving you seasons and seasons of summer family fun! WARNING:CHILDREN HAVE DROWNED IN PORTABLES SWINNING POOLS. ENSURE ACTIVE ADULT SUPERVISION AT ALL TIMES. DO NOT LEAVE CHILDREN UNSUPERVISED IN OR AROUND THE POOL - KEEP THEM WITHIN ARMS' REACH. POOL FENCING LAWS APPLY TO THIS POOL. CONSULT YOUR LOCAL GOVERNMENT AUTHORITY FOR FENCING REQUIREMENTS. DISTRIBUTED IN AUSTRALIA & NEW ZEALAND BY BESTWAY AUSTRALIA PTY LTD.
UNIT 10/71-83 ASQUITH STREET SILVERWATER. NSW 2018, AUSTRALIA. Extra strong side walls are made with 3 separate layers of material. The inner layer of polyester mesh is laminated to the 2 outer heavy gauge PVC layers. 91cm x 116 cm x 54cm approx.. Thank you received in good order and excellent delivery service.